Since its inception in 1919, PAGB has adopted a high standard when it comes to the self-regulation of members’ advertising. Being a member did not, and still does not mean an automatic stamp of approval. The stringent standards set by AMBP, and subsequently PAGB, have meant that even early in our history not every member company has agreed with all our decisions on advertising materials. In 1924, a member resigned purely because it disagreed with the rules. Clement & Johnson manufactured Yadil, a product that made, according to AMBP, “extravagant and unjustifiable” claims. These suggested that Yadil “held out as a cure, or practically a cure, for diseases such as typhoid, diphtheria, scarlet fever and consumption”. Under the rules of the time these claims could not possibly have been approved and the company was directed to implement changes to its advertising. “unless the Association is prepared to consider the alteration of Rule of Membership no. 5(b), which they consider a drag on initiative in endeavours to stamp out disease, we no longer care that this company should remain a member”. Shortly after its resignation Yadil was withdrawn from the market following a negative article in the Daily Mail which highlighted the dubious merits of the product. This early example clearly illustrates the need to have robust standards and to implement these effectively. AMBP demonstrated how it played a valuable role in self-regulating the industry with a focus on quality of membership, rather than quantity. From the very beginning we have held the industry to account and demanded a higher standard of practice from members. PAGB is proud to continue to uphold the principles of honest advertising on which we were founded. 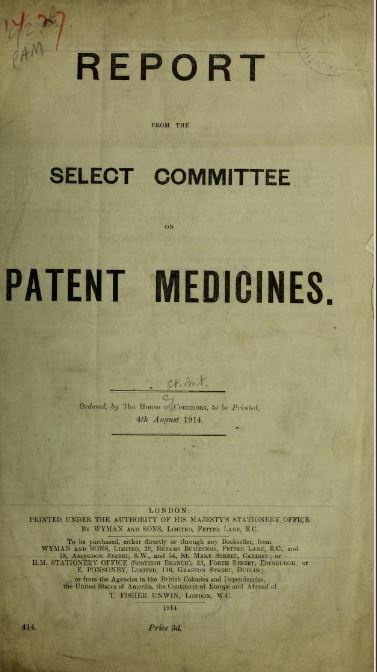 In August 1914, the House of Commons Select Committee on Patent Medicines published a report which noted that “the plethora of available products “are of a widely differing character” with “many secret remedies making grossly exaggerated claims of efficacy” that are “put upon the market by ignorant persons and, in many cases, by cunning swindlers who exploit for their own profit the apparently invincible credulity of the public”. This report was a key factor in prompting responsible manufacturers to come together and voluntarily self-regulate the industry to avoid the need for legislation, something that was considered inevitable if the industry didn’t act, due to the growing concerns being raised in parliament about the efficacy of products. One of the first things the newly formed AMBP did was to compile a register of details of all the members’ products including ingredients, proportions and therapeutic claims. Before this, manufacturers kept such details a closely guarded secret. In those early days, when the only standards for advertising were those applied to AMBP members, several complained that their advertising was being held to a much higher standard than that of non-members. In an attempt to address this, the AMBP wrote to the press setting out its aims and objectives for medicines advertising. Several publishers took notice and decided to consult with AMBP for advice on non-member advertising. A number of newspapers provided assurances that they would not accept certain advertisements as advised by AMBP. It then became part of the remit of AMBP to monitor non-members’ advertising and where necessary, to raise objections with newspapers. In 1927, shortly after AMBP was rebranded to become PAGB, and in order to foster relations with other bodies involved with advertising, PAGB became a member of the Advertising Association. This organisation had been set up three years earlier in 1924 to “promote the rights, role and responsibilities of advertising. Borne out of its increasing frustration with the media’s inconsistency on advertising, PAGB decided to strengthen its Rules and in doing so laid the foundation for the world’s first ever self-regulatory advertising Code, which launched in 1936. This was a huge milestone for PAGB and indeed, in advertising history. “…in advertising, they owe a duty to the public and their fellow members, that is to say, that advertisements should be of such a character that they do not mislead the public not contain statements which would permit criticisms to be levelled at proprietary medicines as a whole or which may cause confidence in proprietary medicines to become impaired”. Many of the principles included in PAGB’s first formal Code of Advertising Practice stem from the original 1919 rules. This included the requirement to have materials reviewed by PAGB and this pre-vetting has been integral in ensuring PAGB members maintain a high standard of advertising practice. Over the years there has been some inevitable friction where the PAGB Code prevented some members from doing exactly what they would have liked. However, our self-regulatory approach means medicines advertising is regarded as trustworthy and there are rarely concerns raised over PAGB member company advertising. Any infringement of the provisions of this code can mean suspension or expulsion. In 1939, the Advertising Association adopted the PAGB Code and recommended other organisations should do the same. It meant that PAGB could achieve its long-held objective of ensuring the principles of its Code were upheld by non-members. PAGB continued to be influential in the self-regulation of advertising, shaping the landscape by working with other relevant organisations and associations. In 1948, the British Code of Standards Relating to the Advertising of Medicines and Treatments was published. Again, this publication ensured all companies were covered by the PAGB Code. JS Walmsley, PAGB’s Secretary at the time noted: “We can take fair credit for the Code. It is based entirely on that of this Association and in substance it conforms with the standards set up by us over many years”. PAGB was also instrumental in the founding of the Committees of Advertising Practice (CAP) in 1961and the Adverting Standards Authority (the ASA) in 1962. On the creation of the ASA, the PAGB Annual Report of 1961-62 stated it was “a notable development of a concept which our Association played an important part in initiating”. We still sit on CAP and have worked with the broader advertising industry in the development of all CAP Codes over the years. From the archives it is clear that throughout its history, PAGB has been at the forefront in ensuring medicines advertising is accurate, truthful and not misleading. Long may this continue.